Heavenly Paws Animal Shelter, Inc. – Saving Cats, One Stray At A Time. Saving Cats, One Stray At A Time. Over 500 Cats Rescued in 2018! Welcome to Heavenly Paws Animal Shelter, Inc.
We are an all volunteer non-profit organization. We operate completely with the help of our generous sponsors and volunteers. We couldn’t do it without all of you! If you are interested in adopting a cat please fill out our online adoption application and we will get back to you within 24-48 hours. If you are interested in volunteering or fostering please fill out our online volunteer/foster application and we will get back to you within 24-48 hours. Please note that in order to foster, you must first volunteer at one of our seven satellite location stores. Unable to adopt, foster, or volunteer at this time, but still want to help? We are always looking for sponsors for our long term kitties. They often need special medical attention or special diets, which can be quite costly on the shelter. If you are interested in sponsoring or would like more information, please click here. Please note that under no circumstance are we able to take owner surrenders. We would be happy to place a courtesy post under our Available Cats page for you. Please click here to contact us regarding your courtesy post. Thanks! Please find us on Facebook to RSVP to events & stay updated! Heavenly Paws will be selling Pizza Hut Value Cards at all of our events! Click to Shop AmazonSmile and Heavenly Paws will receive 0.5% of the price of your eligible AmazonSmile purchases. AmazonSmile is the same Amazon you always shop. Please choose Heavenly Paws Animal Shelter, Inc. as your charity of choice. The kitties thank you! It's simple. Click the above photo to "Adopt" Heavenly Paws Shelter. Every time you make an online purchase at any of the top retailers listed, AdoptAShelter.com will make a donation to Heavenly Paws, based on the % shown for that retailer. 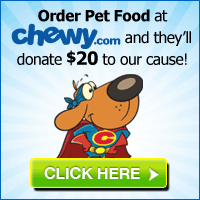 Heavenly Paws Shelter can save more animals, while you shop!